Hedge funds just made an abrupt about face in the palladium market as US sanctions against Russian titans spark concerns that the world’s largest producer of the metal will get caught in the cross hairs. After the US slapped penalties on United Co. Rusal, American officials have sent conflicting signals about whether fresh sanctions will be imposed on other companies owned by oligarchs, such as Norilsk Nickel. 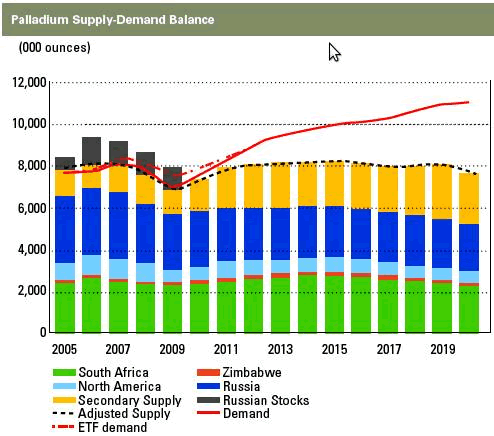 The miner controls about 40% of the world’s palladium market. The turmoil sent prices for the metal to a seven-week high, and money managers increased their wagers on a rally by the most since June. Palladium had fallen about 16% this year through April 6, when the US first announced the sanctions against Russian individuals and companies. The decline came amid concerns that 2017’s 55% surge has sent prices too far too fast. Since the sanctions, prices have rebounded about 14%. Any disruptions to Russian shipments would be meaningful for a commodity that’s already in a tight supply situation. Consumption outstripped production by about 110.6 metric tons in 2017, and the market will see a large deficit this year, according to refiner Johnson Matthey. About 80% of palladium demand comes from use in catalytic converters. Money managers increased their palladium net-long position, or the difference between bets on a price increase and wagers on a decline, by 19% to 8 787 futures and options in the week ended April 17, according to US Commodity Futures Trading Commission data published Friday. That was the biggest gain since June. Total short holdings tumbled 38%, the most since November 2016. Before the sanctions, investors had been turning sour on palladium after the precious metal delivered the best return among major raw materials last year. The metal also got caught up last month in worries that US President Donald Trump’s plans for tariffs on steel and aluminum would stifle car demand. Longer-term prospects for the metal look bright, according to researcher CPM Group. The firm expects prices for palladium and sister metals platinum and rhodium to “rise very sharply” over the next 10 years amid limited supply and robust automobile demand, CPM said in an emailed note on Friday.